Ok a bit of a fib (sort of). 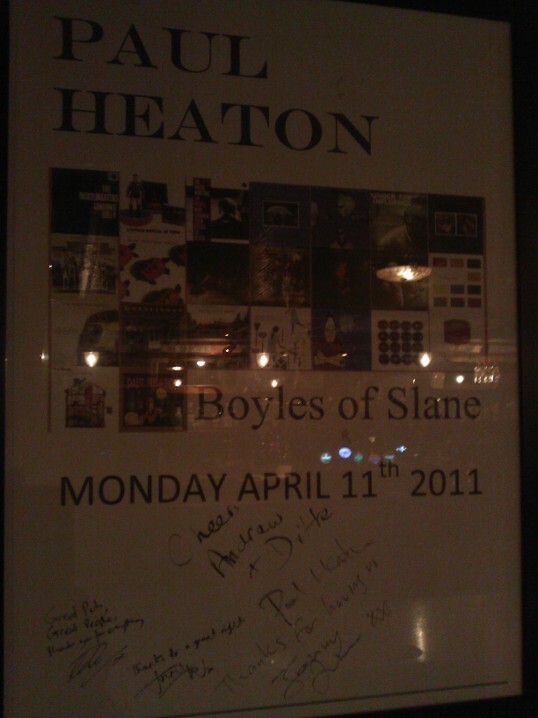 Tonight I played in Boyle’s of Slane which is a very nice venue that hosts the “Purple Sessions”. It’s been a while since I played live. Actually no that’s another fib: it’s only been a few weeks. It feels like an age though. First solo acoustic gig in a long time. It felt strange not having a band behind me ! Even stranger not having Mark who has been holding down the bass for the last 18 months or so. No we haven’t fallen out: he’s got a life, study and work to do so I’m not going to abuse his generosity of time. Anyway I digress…. The show tonight was videotaped so I’ll be sharing it soon. I played material from “Other People’s Hats” and it felt GOOD to be on stage. It felt even better having a listening audience which included a couple of friends who travelled from Drogheda to show their support. The last time I was in Slane was to see David Bowie live at Slane Castle in 1987, the previous time was to see Bruce Springsteen in 1985. I wonder what the teenage me would make of the shaven headed singer-songwriter me ? Why have I kept going when I’m long past the burning optimism flame of youth and, let’s face it, acting half my age playing gigs and writing songs ? I’ve thought about this and it came to me midway through my set tonight: because I have to and because I bloody love it. I’m a show off … so sue me ! I was recently asked this question by a blog reader and it has been on my mind for a few days. Why have I and a few others of a similar vintage (mid-80s hopefuls) either kept going or resurrected their love for making music and why have others stopped? I think if I had burned myself out back then I would probably not be doing this now. I never “boiled over” but rather I “simmered” all this time. Does it explain why I never made it (to use that expression yuk): if I had been more passion back then and stayed the course and immersed myself in what is really my true love would things have been different ? Well of course they would but different how ? I’ll never know.